Jang-Mi has to sell rice cakes on the streets because of Taeja’s carelessness. Meanwhile, Taehee decides to throw away her life and hopes of a happy family now that Joonhyuk has dumped her. At the same time, Minjoo continues to work her way into Taeja’s family. Taeja arrives at work really late and tells Jang-Mi to fire him. He explains that he forget his original intent because he felt a mistaken sense of responsibility for Jang-Mi; now, he’s going to focus on his original goal. Jang-Mi responds that she would never fire him. During the morning, Taeja’s grandfather comes in for his lunchbox only to see Taeja playing on his phone. 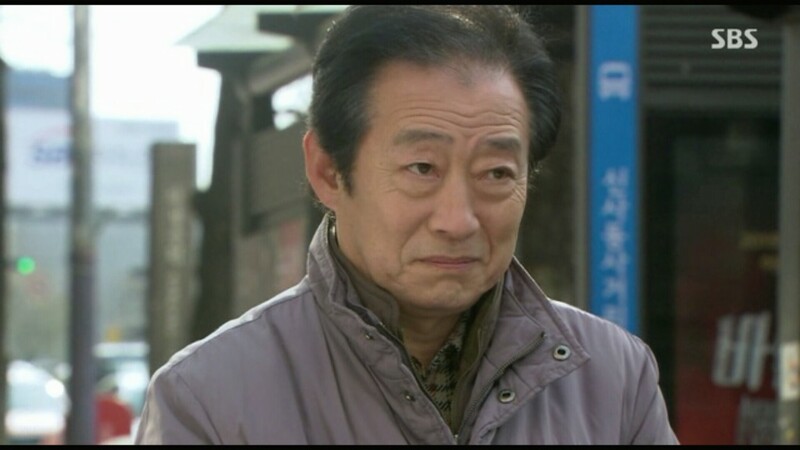 Mr. Jang explains the situation to Taeja’s grandfather, who goes off and kicks his grandson. Before Jang-Mi comes out, he leaves the cafe and she has to run out after him. Taeja’s grandfather informs her that he doesn’t want his lunchbox today; it’ll have poison in it. Jang-Mi reassures him that there’s no poison in the rice cake and Taeja’s grandfather explains that people with heavy hearts cannot make delicious rice cakes. He tells her to reconcile with Taeja. Jang-Mi smiles shyly and tells him to at least take his gift. She explains that its gift for being a repeat customer and that she bought it with her first paycheck. After she leaves, Taeja’s grandfather opens the box and looks at the gloves with a smile. Meanwhile, Jangsu finds his mother trying to get a job. He tells her not to worry as he’s not going back to school; rather, he’s going to work and he will take care of the family. Unfortunately, this idiot’s idea of working is taking out a loan to buy the land himself! I guess he thought that if he buys the land, he won’t be fired and he can pay it off with the $1,800 he receives monthly with the possibility of receiving $1,800 in commission each time he makes a sale. At the cafe, Taeja gets yelled at by a customer to pick up the phone and he ends up taking an order for delivery. He writes it down and posts it to their whiteboard, ignoring Jang-Mi’s question. In the bathroom, Mr. Jang tells Taeja to reconcile with Jang-Mi. Taeja complains that he already apologized so many times! In response, Mr. Jang gives some good life advice; if the person refuses your apology, you have to continue to apologize. Taeja just asks to be fired and Mr. Jang responds that it’s up to Jang-Mi. Finding himself in a horrible mood, Taeja changes and leaves the cafe with Jang-Mi running after him. She tries to stop him from leaving in the middle of the work day by grabbing Taeja, who pulls out of her grasp so forcefully that Jang-Mi falls to the ground and cuts her hand. Although he looks like he’s sorry, Taeja still leaves. Instead of working, Taeja heads off to bowl with Minjoo. While bowling, he gets a call from his mom letting him know that Taehee’s arranged date is coming over to greet the family formally. That night, Taeja runs into Jang-Mi at the courtyard and Jang-Mi instructs him to come in an hour early the next day due to the large order. However, when the next day arrives, Taeja wakes up just to watch television as he’s taking the day off. At the same time, Jang-Mi stops by to ask Mr. Jang about dry-cleaners nearby and offers to take anything that he needs dry-cleaned. Mr. Jang gives her Joonhyuk’s suit after taking out all the paper in the pockets. Yay for daily dramas not hiding things for long! Mr. Jang finds the receipt for the vitamins and comments in surprise that Joonhyuk bought so many. Jang-Mi realizes that Joonhyuk had bought her the vitamins that he had explained were gifts. She takes the suit and heads out. Meanwhile, Mincheols’ mother stops by her son’s hospital to get a facial. It turns out that she had asked the front desk girl to schedule Taeja’s mother at the same time. She chatters on as they get ready in the facial room; she proudly brags that there’s so many offers for arranged dates for both her son and Minjoo. She exclaims that she doesn’t know why Minjoo rejects all of the offers and doesn’t seem interested in any guys. Rather, the only guy that she ever spends time with is Taeja! Taeja’s mom smiles but answers that the two are like siblings. At the same time, Minjoo stops by and calls Taeja because she was coincidentally in the neighborhood. She offers to give him a ride home and slyly mentions that she’s also curious about Taehee’s new guy and Taeja invites her to join if she has time. At the cafe, Jang-Mi gets a call from the customer, who tells her that the order was incorrect. They had ordered 50 and not 500 rice cakes. Jang-Mi and Mr. Jang try to call him, but he ignores all of their calls. The cafe is a mess over the unsold rice cakes. Jang-Mi apologizes for Taeja as she should have confirmed. She also offers to sell the rice cakes outside the cafe since rice cakes need to be tossed, if they are not sold within the day and calls her mom to help. At her first attempt, she gets kicked out by the security. She next goes to a place with a lot of older people and agrees to deliver any purchases to their children. Minjoo accompanies Taeja into his house and greets Taeja’s mother. She asks Minjoo whether she’s not seeing any guys and Taeja explains to his mother that Minjoo has high standards; a lot of his friends even tried to hit on her but she never seemed interested. To this, Minjoo shyly comments that she thinks she will know when she sees the right person and looks at Taeja…However, Taeja’s mom just laughs and dismisses Minjoo to return to work. Taeja invites Minjoo to stay if she has time, but his mom cuts in to say that it would be rude to Taehee’s date as Minjoo is not part of the family. Smiling, Minjoo excuses herself for work. However, once outside the house, she pauses to glare and think that she will one day live within that house as part of the family. Taehee’s date tells the family that he likes everything about Taehee. Taehee’s grandfather notes that the date’s answer isn’t really an answer. Additionally, Taeja cuts in to tell the guy that Taehee can hold her liquor. If they haven’t had the time to drink together, they should. The guy replies that he wants to try drinking with Taeja one day and Taeja responds that he needs to get to know Taehee first. Instead, the guy tells the family that he wants to get engaged to Taehee; his family approves and Taehee has consented. Taeja follows Taehee into her room to ask if she’s even thinking before she decides; she’s only met the guy a few times. Taehee responds that it doesn’t matter if she’s not going to marry Joonhyuk. Next, Taeja storms into his mother’s room to tell her to stop this as Taehee doesn’t love the guy. But, his mother doesn’t find this a convincing excuse. She tells Taeja that she never loved his father but she lived happily with her family. Taeja sighs in exasperation and responds that he didn’t think either of his parents were ever happy. His mom responds that she doesn’t believe that she would have been happier if she married a man whom she loved, but who wasn’t rich. Taeja reminds her that Taehee is different from the two…she used to hide that she came from a rich family; she needs love to be happy. Meanwhile, Jang-Mi continues to sell rice cakes near subway exits. She gives out free samples and reassures the people that the rice cakes were made that day to make as many sales as she can. At the same time, Minjoo comes in to be accosted by her mother. Her mother asks Minjoo how often she sees Taeja and tells Minjoo to stop by Taeja’s house to let his mother know. Minjoo asks why her mother is asking all of a sudden and her mom tells her about the conversation that she had with Taeja’s mother. Minjoo exclaims in exasperation and begs her mother to not say anything to Taeja’s mother. Small interlude as Mincheol’s mom sees her husband drinking an expensive drink that she hid for her son. She tells him to his face that she had hid it and doesn’t want him drinking any of it. Jang-Mi comes back after selling another box to get another box. When Mr. Jang comes back to the cafe, Jang-Mi’s mother complains to Mr. Jang to order that Jang-Mi come back in. Mr. Jang agrees to go and bring Jang-Mi in personally when Joonhyuk stops by on his way home. Hearing about the fiasco, he heads out. Jang-Mi is in the midst of offering free samples and has to pick up the pieces of rice cakes that fell when a passerby bumped into her. As she picks them up, a man asks how much the rice cakes are and Jang-Mi looks up to see Joonhyuk. He offers to buy all of the leftover rice cakes and Jang-Mi refuses his charity. In response, Joonhyuk tells her not to misunderstand. He needs the rice cakes. Next we see Joonhyuk and Jang-Mi handing out rice cakes and drinks to the homeless people who are at a rehabilitation shelter. They happily walk out together and Joonhyuk offers to buy dinner as it’s already 10. Jang-Mi declines to eat when she gets home and ends up stumbling now that she’s no longer on the edge about the rice cakes. Joonhyuk catches her. Jang-Mi falls asleep in the car and it’s adorable how Joonhyuk ends up like his father. He waits quietly for Jang-Mi to wake up rather than waking her up. At home, Jang-Mi refuses food because she’s so tired. Taeja finally comes home to hear about the fiasco. OMG >.< I just feel for JH and he only showed up for five minutes during this episode. There is just something about a really capable man, helping a girl out when she’s in trouble. However, that’s a hackneyed concept. 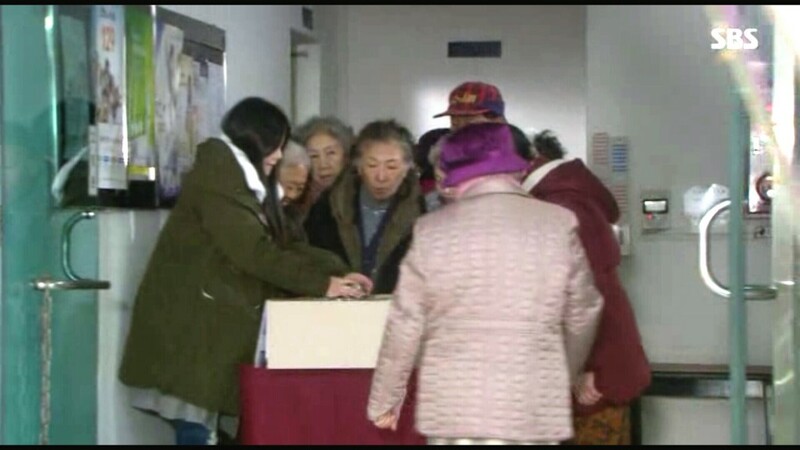 The writers hit it out of the park with Joonhyuk buying all of the leftover rice-cakes to deliver them fresh to the homeless people in the rehabilitation shelter. Now, the dynamic between Minjoo and Taeja’s mom is quite interesting. Taeja’s mom is not stupid. Rather, she is quite adept at playing the high socialite’s game. Therefore, she can’t not know about Minjoo’s feelings for Taeja. Instead of discouraging it, she encourages it so that she and Taeja can benefit from Minjoo helping out, but never expects to allow Minjoo to join the family. It’s kind of scary how calculating she is. I almost feel like I should support Minjoo. That’s probably why, I was excited to see Minjoo declare her own war on Taeja’s mother. I am looking forward to seeing how this duel ends. On a side note, Jang-Mi’s mom is rocking the plaid coats. I wonder what is up with Korea and plaid these days.